Here it is, the inventory sale from the items I had at the fair last weekend! I'll be holding this sale for the next two days. If you want something at the sale price, but you want to wait until, say Friday, to get it, send me an e-mail and I'm willing to work with you. Otherwise, these prices are only good for the next 48 hours. After that, they'll be listed in my Etsy store at regular pricing. You can feel free to comment on anything you like with no fear that I'll think you want to buy something. The only way to actually buy it is to send me an e-mail at suliabryon (at) gmail (dot) com. First e-mail to ask for an item gets it, so don't wait if you're really wanting something. Inventory on these is limited to what's on hand. Shipping is included free in the sale price! Paypal is the preferred payment method. 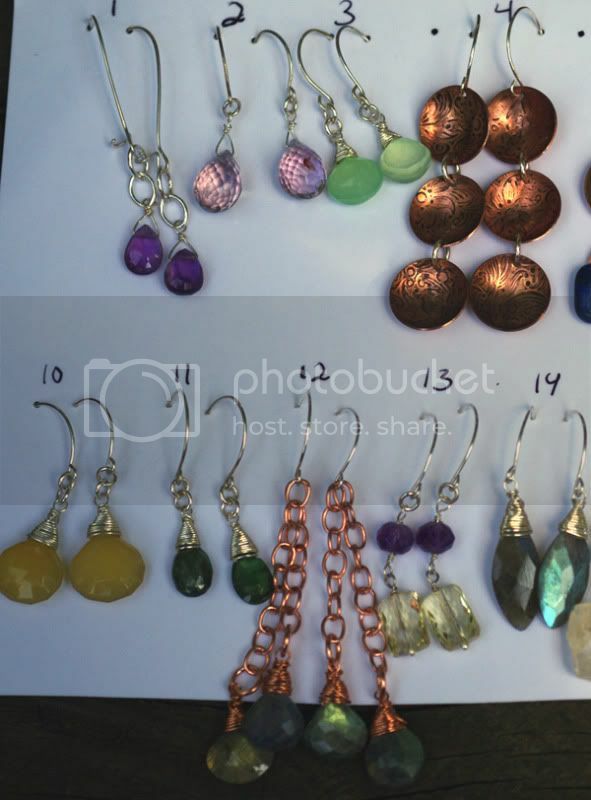 All earrings are made with sterling silver earwires, handmade by me. My earwires are comfortable to wear, even on the phone, and they stay better in your ears than standard hook wires. 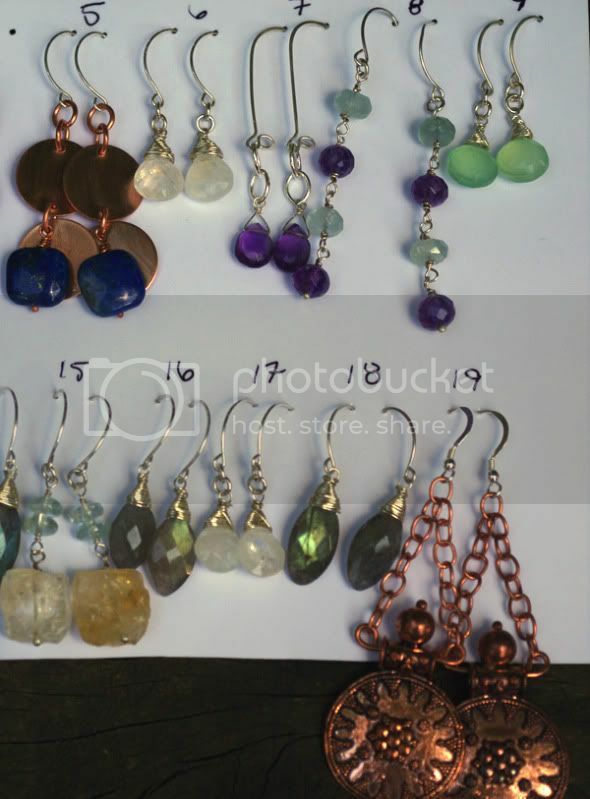 A few pairs of earrings here even have my handmade kidney earwires, which are not only comfortable, but super secure. 1 - Sterling silver and deep purple amethyst briolettes on kidney earwires. 2 - Sterling silver and micro-faceted lavender amethyst briolettes. 3 - Sterling silver and green chalcedony briolettes. 4 - Copper cups, hand cut and formed by me, patterned by me with my rolling mill, and oxidized to bring out the pattern. Sterling silver earwires. 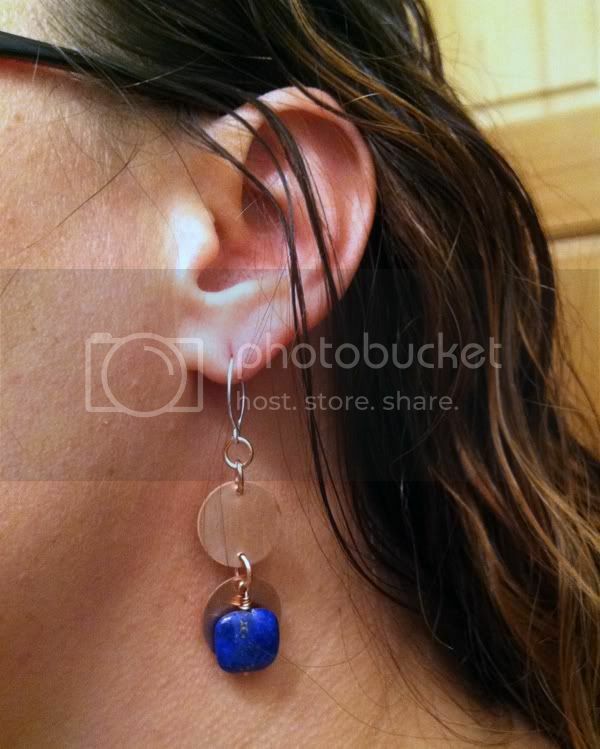 5 - Copper discs and lapis lazuli squares w/sterling silver earwires. 6 - Rainbow moonstone briolettes and sterling silver. 7 - Sterling silver and deep purple amethyst briolettes on kidney earwires. 8 - Aquamarine and amethyst rondelles with sterling silver. 9 - Sterling silver and green chalcedony briolettes. 10 - Sterling silver and yellow chalcedony briolettes. 11 - Sterling silver and green tourmaline briolettes. 12 - Cooper chain, labradorite briolettes, with sterling silver earwires. 13 - Amethyst rondelles with citrine squares AA quality, with sterling silver. 14 - Sterling silver and labradorite briolettes - these are exactly the same as my Old Black Magic earrings listed in my Etsy store, but at a great sale price! 15 - Aquamarine rondelles with rough faceted citrine nuggets and sterling silver. Very unique! 16 - Sterling silver and labradorite briolettes - these are exactly the same as my Old Black Magic earrings listed in my Etsy store, but at a great sale price! 17 - Rainbow moonstone briolettes and sterling silver. 18 - Sterling silver and labradorite briolettes - these are exactly the same as my Old Black Magic earrings listed in my Etsy store, but at a great sale price! 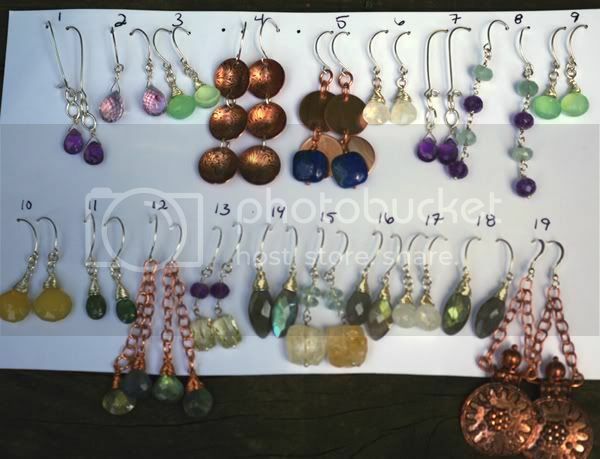 19 - Uniquely detailed copper discs suspended from copper chain and sterling silver earwires. 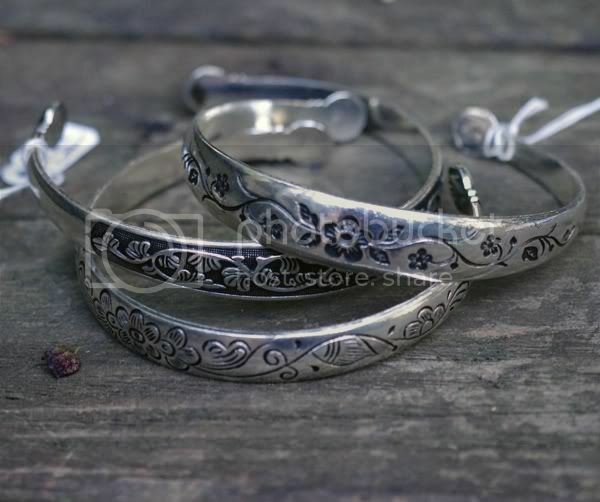 These three bracelets are one-size-fits-all copper cuffs with silver plating. $12 each. This labradorite is much flashier than the photos show. 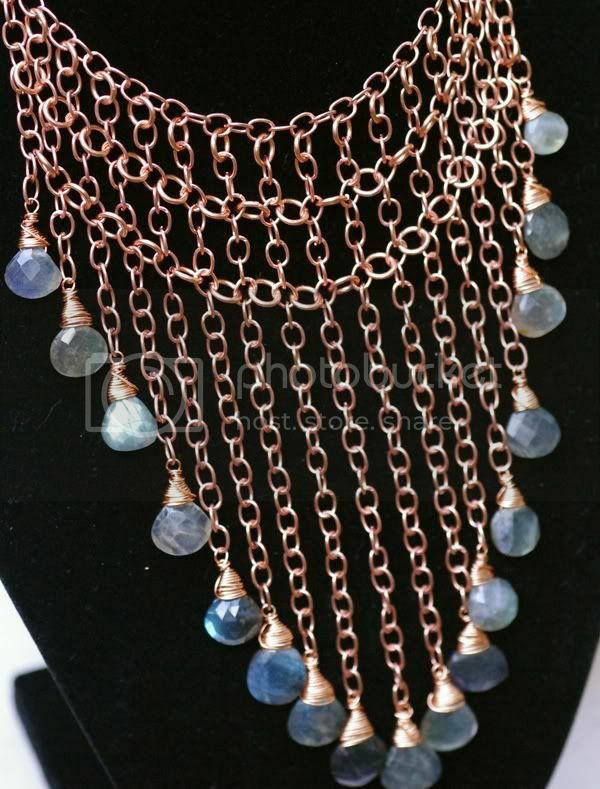 It's absolutely spectacular, and goes really well with the copper chain it is paired with. This is a dramatic piece that would look stunning with a V-neck shirt or dress, and it spills from your neck down to your décolletage. 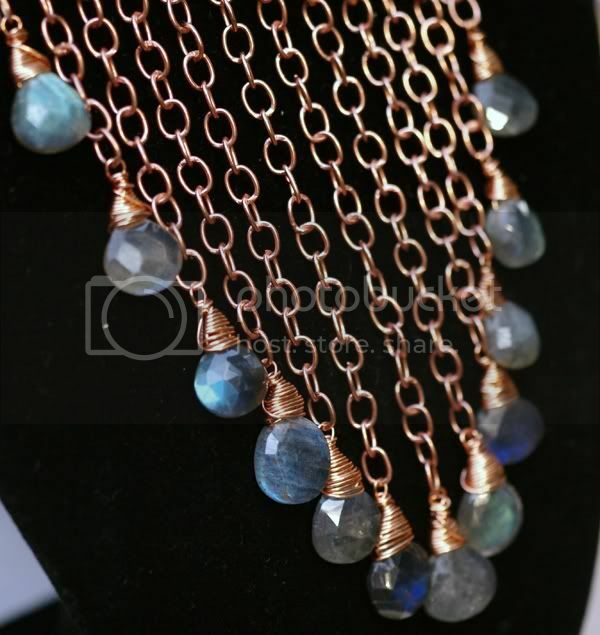 The copper will naturally darken and oxidize with age, looking stunning with the labradorite. Normally priced at $105, I am setting the sale price for this necklace at a steal for $60. Another version, but with lapis lazuli pillow squares and copper circles. This one jingles as you move! This one hangs in exactly the same way as the previous necklace. 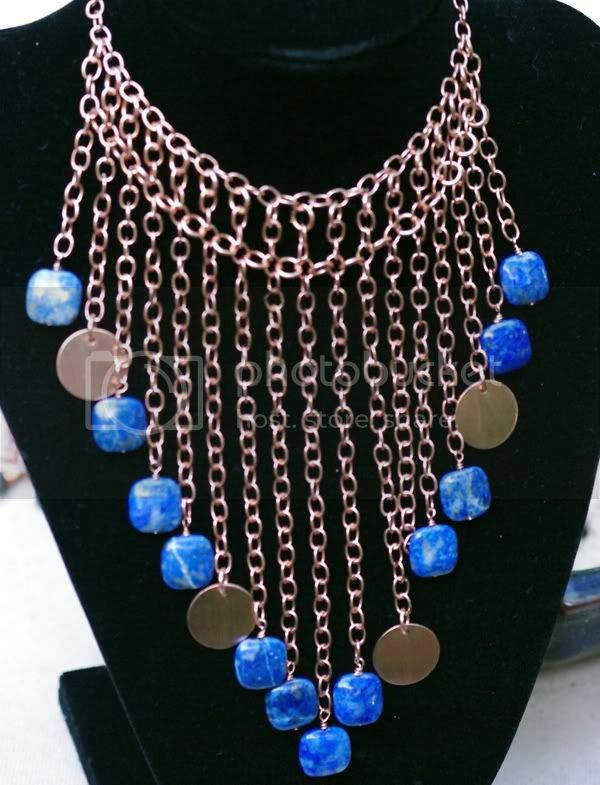 Copper and lapis are gorgeous together, in fact, lapis is my favorite stone to put with copper. I think the pyrite inclusions in lapis are set off in a way that silver simply cant match. Normally priced at $95, I'm letting it go at the sale price of $50 for the next two days. Savvy customers will note that there are matching earrings available for both of these pieces, until they're gone that is! ** NOTE: I have matching pendants available for earrings 1, 3, 6, 7, 9, 14, 16, 17 and 18. Individual pendant pictures will be listed soon. Pendants will go for $15 apiece. OT but did you see all the Korra stuff that came out of Comic Con? SLKIEDFNKLDSHJAOIWUFHASDFN. The trailer, and all of the background stuff we got about the original Team Avatar (an entire herd of Sky Bison!!) Tenzin and his family. Toph!!! And the trailer! The statue of Aang! The music! The bending! So. Awesome. And we get two seasons! Okay, so 12+14 episodes is really more like a season and a miniseries, but whatever. I'm just so excited. Do you have any other pictures of #4? I really like them, but I'd like to get an idea of how long/big they are before I commit.